Where is the line between sane and insane? Is it nature or nurture that creates a killer? These are just a couple of the questions I thought of while reading Thomas Harris’s Red Dragon. Francis Dolarhyde is an intriguing character with a complicated psychological profile. He was abused when he was younger, particularly by his grandmother who went as far as threatening to cut off his genitalia. This abuse helped lead Dolarhyde into becoming a serial killer later in life. As scary as this may be, he turned into a bully, to say the very least, because of the abuse, and this is consistent with how bullies are typically those who were abused at one point in their youth. Dolarhyde’s abuse was extreme, which created an extreme killer. But he still feels weak, and this creates another facet of his personality. In order to combat the feeling of weakness, a separate personality, that of the Red Dragon, forms. The Red Dragon is everything Dolarhyde is not–that is, fearless, powerful, willing to kill, and, perhaps more importantly, provides a stability in Dolarhyde’s life that went missing when Dolarhyde no longer had his grandmother and stepfamily around; abuse, namely, is that stability and this is seen when the Red Dragon threatens to force Dolarhyde to cut off his own genitalia. Dolarhyde was born with deformities. This also helped shape him into a killer. When he was born, had his doctor not suggested to wait for five years to fix what was wrong, perhaps he would never have become the Dragon. Then again, his upbringing may have played a much more important role and no matter how imperfect or perfect he was born physically, he would have still been shaped into the man he later became. Despite the upbringing, there could be something in his nature that helped him become a killer as most people, no matter what happens in their lives are incapable of killing. Although Francis Dolarhyde is a fictitious character, he proves to be an interesting case study. For Dolarhyde, what plays the biggest role in his becoming a serial killer? On my first read through, it seems as though nurture had a greater impact than nature. But perhaps there is something happening deeper within him; if the nature aspects of his personality as a killer are in the book, they are much more subtle and a couple of more readings would be required to find out. One of my favorite things about this book, in addition to trying to figure Dolarhyde out, is the parallel between him and Will Graham, the protagonist. Graham has killed before, but unlike Dolarhyde, it wasn’t out of some youthful trauma, but through self-defense. He knows what it’s like to kill, even if it’s not in the same way as Dolarhyde. What’s more interesting is how close Graham gets to thinking like a serial killer during his investigations. He practically becomes a serial killer, which prompted my question about where the line is that a person crosses from sanity to insanity. Graham and his nature seem to play a key role in his ability to solve these types of cases. If he had just been pushed, perhaps even slightly, when he was younger, it’s reasonable to think that he could have fallen over the line and become not such a good guy. This parallel between the protagonist and the villain was my favorite part in this book. 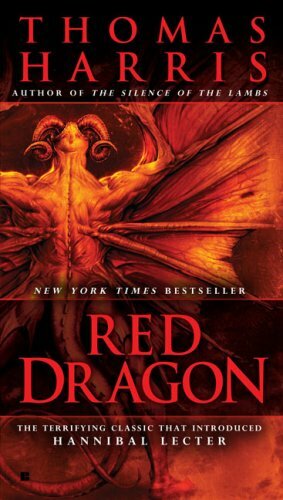 Overall, Red Dragon has become one of my favorite books. I was fascinated by the detail woven throughout the story and am now a Thomas Harris fan. I loved how this book raised so many nature/nurture questions, I didn’t consider what you pointed out, how Graham, like Lector, seems to be driven by his nature rather than his conditioning. I wonder how it would have been if his character was Clarice in Silence of the Lambs, and it was nature vs. nature between Graham and Lector. I guess it was initially between the two of them, when Graham figured out it was Lector in the beginning. What I remember about Clarice is she was driven by screaming lambs and her police officer father’s death, more nurture things. I wonder if Thomas Harris does the nature dominant vs. nurture dominant influenced characters formula on purpose. I mean, of course they are all a mix but one influence seems purposely dominant over the other, just sayin’. If I read any of his other books, I’ll look for it. I like the idea of the Red Dragon persona providing stability for Dolarhyde – almost like a parental figure filling the same role his grandmother once did. Their relationship (if that’s the right word) was pretty messed up, but I didn’t notice the parent/child aspect of it until you mentioned it. I really enjoyed how Will seemed so close to crossing the sanity line. The way he can easily slip into the killer’s mind is unsettling. I think that Will did step on the line, if not outright, when he gave Freddie Lounds the false profile on Dolarhyde. With how much Will can get into other people’s heads, he had to have known that there was a high chance Dolarhyde would target Lounds. He even questions how far he’d truly gone after Lounds died. I thought it was interesting how Dolarhyde is almost the “classic” serial killer. If you have every done any research on serial killers (I don’t know if you have, but I’ve done a TON), the chapters in the middle of the book where we get the familial background on Dolarhyde seemed to read like a “textbook” case. For me, that was actually a little bit of a turn off. While I appreciated Harris’s thorough research, I felt that it made Dolarhyde too stereotyped.